sing the chorus-kids while high stepping across a mountaintop in the Shah Rukh starrer Pardes. The closest I ever got to hunky Shak Rukh was the backseat of an auto-rickshaw. Hot stuff. 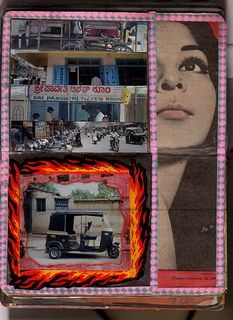 Auto-rickshaw, collage by Barry Silver. The backseat’s where the driver curates a poster gallery of filmi celebrities. The stars are usually presented in pairs, so the passenger may find herself seated between pretty Preity ZInta and three-thumbed Hrithik Roshan. Third-wheeling in a three-wheeler, I am happiest squeezed between he-man Shah Rukh Kahn and green-eyed goddess Aishwarya Rai. 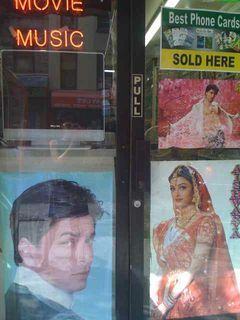 Shah Rukh and Ash, East Sixth Street, NYC. Love him because he remains a phenomenon even unto his own self. There is only one Shah Rukh. There will only ever be one Shah Rukh. Shah Rukh is not worried about upstarts and pretty boys. No, Shah Rukh and every other Kahn should only worry about flying into Newark. But I also love books about other people’s India. This is my favorite author and this is an awesome novel, held (by those qualified to make such claims) to be one of the greats and to have revolutionized the form. The story is set in Africa among an Indian community of merchants during the collapse of colonialism and the violent yet fragile rise of self-rule. Naipaul grew up in Trinidad of Indian parentage. His first novel, A House for Mr. Biswas, depicts the varied cultures, challenges and hardships of the island, his family and childhood. It is a great work, fat to bursting where A Bend in the River is lean and pointed. This is a non-fiction work by a wonderful historian. It is the history of 18th century Brits in India. It reads as great fiction: entertaining, sensual, shocking, and suspenseful. The only reason to put down the book is to refill the hookah. At 1400 pages, and with each chapter introduced by a sonnet, this book is not a casual encounter but a serious commitment. It also requires carpal tunnel syndrome-free wrists. As several families and generations cross paths, the novel reveals the diversity and multiplicity of a single nation. At the heart of it: a widow seeks to marry her daughter to a suitable boy. This Pulitzer Prize collection of short stories precedes the author’s celebrated novel, and now film, The Namesake. These stories are stunning and nuanced, each one far superior to the disappointing Namesake. This is a diverse collection of Indians abroad and Indians in India. A novel woven from remarkable histories of Burma, India and Malay. A shifting of powers, peoples and precious resources from colonialism through World War II. An unbelievable tale based in world history and that of the author’s family. This non-fiction treatise on India explains the culture better than I ever could and I’ve been trying since I first traveled there in 1995. Written by an Indian diplomat who is current president of the Nehru Centre, Varma’s volume is part think-tank/part tough love. In this non-fiction book, Mehta leads the reader inside contemporary Mumbai’s purgatory of corruption, gangsterism, dance halls, Bollywood power cliques and religious extremism. Fun, thrilling, and exhausting. Read this and save on airfare; it’s just like being there. Collected oral folk tales of India gathered by the celebrated folklorist. These tales tap the subconscious dreams and fantasies of a people and their culture; a dark and honeyed sap. Here are worlds where fools are wiser than kings and unspeakable suffering may or may not transform and transcend. Haunting and unforgettable. A novel by the screenwriter inspired by his youth and teen years in suburbia and moving on up to pretty and punk London. Witty and hip. Kiki and rickshaw professional Bharat. His name means India.